Globetrotters’ stars and Ambassadors of Goodwill, TNT Lister, Handles Franklin and Cheese Chisholm, presented the “ABCs of Bullying Prevention” to over 1500 students from Dubai International Academy, Raffles World Academy and Collegiate American School. The 30-minute program, designed in coordination with the American National Campaign to Stop Violence (NCSV), focused on Action, Bravery, and Compassion, comprising the ABCs. 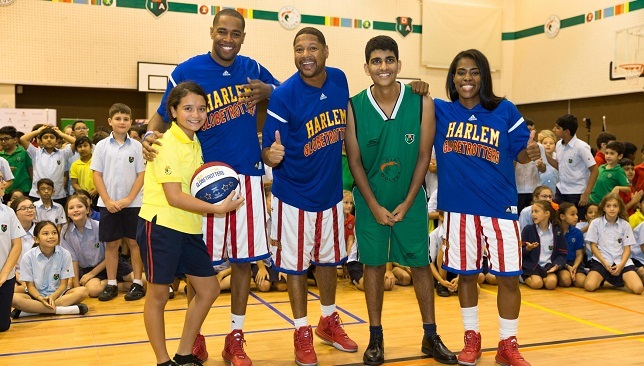 Dubai International Academy (DIA) was one of the schools the Globetrotters visited on their two-day tour. Primary school principal, Tim Richardson, said the DIA does not tolerate bullying or harassment. “All members of the School community are committed to ensuring a safe, supportive environment, based on the school’s values of learning, respect and cooperation,” he said. During the session the children were also treated to a taste of what the Harlem Globetrotters will do when they return to Dubai with the rest of the team as part of their 90th Anniversary World Tour. For more information of their upcoming tour, click here. 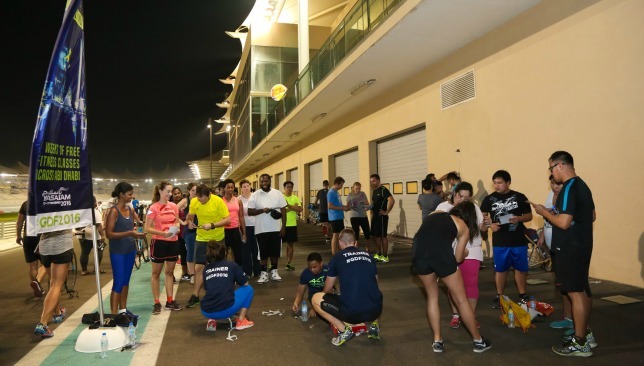 On Saturday night the Yas Marina Circuit was teeming with people of different age brackets as the fourth annual Get Driver Fit got underway. The fitness programme offers free fitness classes across Abu Dhabi in various locations such as Umm Al Emarat Park, Bodytree Studio, Yas Marina Circuit, Haddins Gym at Zayed Sports City and Residence at St. Regis Resort Saadiyat Beach. Spanning seven weeks, the classes include Zumba, yoga, boxing fitness and beach bootcamps encouraging the community to get better in shape. Participants will have the opportunity to win a variety of prizes based on their performance. This time round Get Driver Fit will reach out to Abu Dhabi universities for dedicated classes targeting students from participating schools, running from October 9 to November 17. Those who wish to pursue workouts may do so by heading down to the Muscle Beach along the Abu Dhabi Corniche from November 17 to 27. Copying last edition’s format, the programme will reach the grand finale from November 17 to 19 at the Abu Dhabi Corniche, overseeing three days of competitions and a triathlon-style obstacle fitness course challenge, including body board paddling, fat bike cycling and obstacle course running. “It is very encouraging to see a positive response and engagement from Abu Dhabi residents to the programme for the fourth consecutive year,” said Dr. Sven Rohte, chief commercial officer at event sponsor Daman. “It is an excellent way to get people moving and to help the community get involved in healthier ways of living. It is through events such as this that we at Daman hope to bring about a tangible improvement to the health of the UAE community. Classes for the Get Driver Fit programme are now live across the capital until November 16. To learn more about GDF check out the official community page at www.facebook.com/GetDriverFit and use the #GDF2016 hashtag. 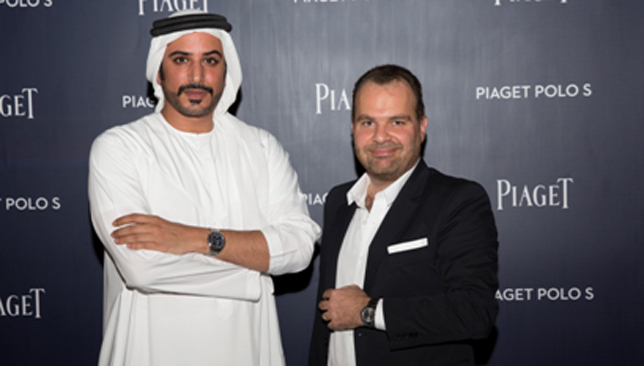 The Dubai launch of the Piaget Polo S,served as the ideal platform for Piaget to announce its new local game changer, Mohammed Sultan Al Habtoor. The Piaget Polo S is designed for men who are ready to rewrite the rules and thus Piaget have selected nine ‘game changers’ from around the world in recognition of their exceptional talent. Mohammed Sultan Al Habtoor joins the ranks of these brilliant men, led by Piaget’s international brand ambassador, Hollywood actor Ryan Reynolds. Through his work and innovative ideas, Mohammed Sultan Al Habtoor has been one of the first to change the existing rules and set new trends in his country while always respecting traditions. Born in United Arab Emirates into one of the most prominent and successful families in his country, Mohammed Sultan Al Habtoor is changing the way Arab men look at fashion. After officer training at the UK’s Royal Military Academy Sandhurst and five years military service, he co-founded his own company specializing in healthy lifestyle products. Having made a name for himself at an early age, he is well known for his individual style statements. Al Habtoor is a man that respects local tradition but is also avant-garde individual who has undoubtedly, and very positively, changed the game for the region. The videos are shot from the back thus illustrating the view from the ambitious eyes of Al Habtoor. Taken its name from the elegant and demanding sport of polo, the Piaget Polo S is a tribute to the brand’s classic, yet also a passionate appeal to a brand-new era. The Piaget Polo S features an ingenious shape-within-shape motif, a distinctive hallmark of Piaget, with a cushion-shaped face presented in iconic Piaget blue fitted within a round 42mm case. Designed and manufactured exclusively by Piaget, its renowned 1110P automatic movement discreetly displays its beauty through a sapphire case-back. A bracelet of meticulously hand-assembled links, alternating between polished and satin finishes, binds the watch together, completing the experience. The result is a watch that—whether it is by day or by night, at work or at play—speaks to and for a new generation of game changers.